Well that’s been a fast 5 months! Just the other day it seems like I was bitching about my $170 cell phone (and cable!) bills, thinking I’d do exactly what I always do about it over the years – nothing ;) But for whatever reason J. Money 2.0 stepped up to the plate, and here we are with almost $3,000 in the bank that didn’t exist 5 months ago! Hot damn! Not only have we saved $2,954.14 without sacrificing any quality of life, but even more exciting is that it’s $2,954.14 I can now do whatever the hell I want with! Because it’s all “extra” and unaccounted for! This is the power of challenging all your bills and “stuff” – any actions you do only adds money to your pockets and opens up the options. And if you then throw on your patient pants and SIT on this money as we’re doing here for a whole 12 months (so that we really appreciate the magic of compound savings), it allows you to dream even more. What would you do with an extra $3,000 right now?? Or an extra $7,300 by the end of the year at this current rate? Car insurance — Haven’t lifted a finger since our 15 min phone call which resulted in $30 savings each month. Not everyone will have the same luck, but even if you only saved $10/mo from 15 minutes you’d have $100+ every year going forward! 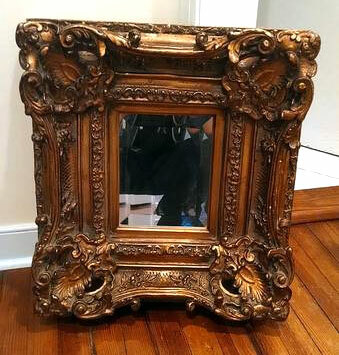 SOLD: Gold ornate mirror — This guy I bought on a whim for $20.00 a few years ago, and then realized it was made entirely of plastic. Oops. I should have known when it was only $20 and saw the “made in China” sticker on the back :) Still, it had the exact gaudiness I was going for and it proudly hung on our wall until the kiddos came around… Now we have a painting of Noah’s Arc and all these colorful animals our boys would much rather see than a reflection of themselves, haha… So instead of looking for another wall to put it on I decided to list it for the same $20 I paid and figured I’d just keep it if it didn’t sell. A local photographer picked it up a few days later to be used as a studio prop – perfect! Cashed in change! — Every night I throw all my spare change into a jar, and then whenever the jar get’s filled I head to the bank and either deposit it or get it back in dolla dolla bills for splurging. This time it went straight into our Challenge savings. Christmas money from the mother-in-law — She always gives us money every year, but this time it seemed a LOT more than usual. My wife says it was go cover both of our gifts as well as spoil our two children, so I just asked if we could bank it here into our Challenge Account since we had already paid for our kids’ Christmas gift on her behalf, and she said sure. So part of this $ was reimbursement, and the other gifts that my wife and I juts did without since we’d rather have the cash. 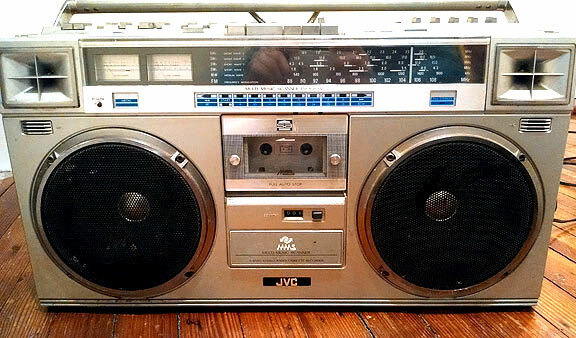 SOLD: Vintage JVC boombox — This is the best flip so far – a $2.00 yard sale find I never use for $50 smackaroos! And do you know how much this bad boy goes for on eBay? Anywhere from $100-$500, dayumm… I knew it was worth more than $2.00 but talk about the power of researching first. This is one solid “ghetto blaster” (a term I picked up from doing the research – never heard of that before?) and if anyone dared rock it on their shoulders a lot the 80’s they’d need a chiropractor the next day ;) The thing sure did shake our house though! I had it on maybe 10% of the volume and my whole kitchen table was vibrating – it’s a freakin’ beast! With tons of ports and nobs and gizmos to beat. Much better than the crap that’s made these days… So why sell for $50 instead of $100-$500 on eBay? Convenience. And I also hadn’t tested anything outside of the radio so wasn’t 100% everything worked correctly which I made note of in the listing. When the guy picked it up from me I asked what he was going to do with it and he said “You know what I’m going to do” haha… And I did – throw it on eBay :) (This guy was a radio freak and made thousands on eBay every year flipping stuff). Credit card rewards — These get automatically paid against our c/c bill every year, but instead of letting myself off the hook that easily I quickly xfered it into our savings here so that we can fully appreciate these rewards. What fun is it going straight to your c/c bill?? (We put all expenses on our card fyi and then pay it off in full each month. Simply to earn these hundreds every year (we have the USAA Cash Rewards World MasterCard – it doesn’t pay as much as other cards out there, but we prefer the convenience than playing the card hacking game)). Time keeps passing like a mother. Not so good for our boyish good looks, but very much so for compound savings! 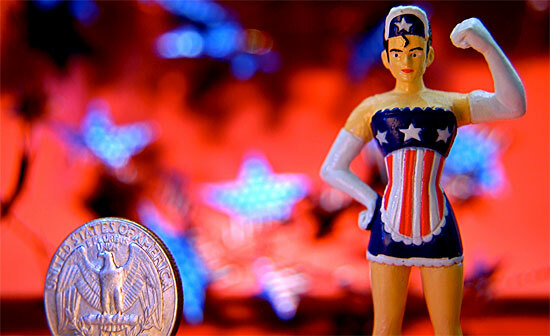 You get a lot more random money than you probably realize. That $1,400 up there consists of 21 separate times I received money for things I mostly wasn’t expecting. Where would that money have gone if you’re not paying attention to it? It’s crazy how you don’t ever miss your “stuff.” It is hard to get rid of my *cooler* stuff, I’m not gonna lie, but I hardly notice it’s gone once it is. I’m reminded of the times well spent with my stuff before it was sold. This sounds like the opposite of everything this mission stands for, but we rarely take into consideration all the joy some of our things actually did bring at one point – even if short lived. It’s not like we buy crap we initially hate, right? So I’m finding more appreciation of my stuff for however long it was under my watch, which is a nice extra on top of the money earned from offloading it years later. And, lastly, freedom > income > stuff. The stuff is nice sometimes, the income is even better, but at the end of the day it’s all about more freedom in our lives. And every time I sit down to do these monthly updates it’s like a giant tsunami of joy crashing over me :) We now have almost $3,000 to improve our lives with! And it’s only month #5! It’s time you start challenging your lives as well. *Not the point of this exercise. What the? I had no idea old ghetto blasters (boom boxes) were worth so much. I have to tell my Dad, he’s got a few in his garage. That is some solid effort right there, well done you. Oh also – I totally bank everything my parents and in-laws give my son. They hand us cash to buy him something special and I’m like “Yeah, cool having a down payment on a house when you’re 18 is pretty special”. I take maybe $2-5 and buy him a toy from the thrift shop and put the rest in his savings account earning 4%. He doesn’t know the difference between a new and old toy. He’ll thank me when he’s older. 2) How the hell do you get 4% interest??? That’s incredible! You may not get 4%, but check out Kasasa. They have programs with banks where you can get 2 – 3%. But the banks and credit unions are not everywhere. Awesome work on this! Although I don’t know … I might have held on to that Boom Box. That thing was a beauty! I’m noticing how much the “random” and “fun” money really adds up too. I don’t have a dedicated account for it, but I do work it into my budget for the following month so that I’m forced to think about how I want to spend it rather than just blowing it all thoughtlessly. 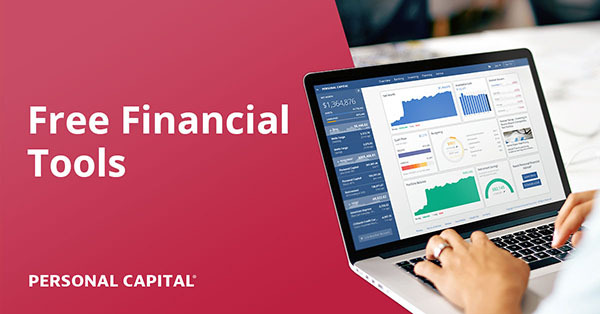 Do you report your capital gains from your yard sales to the IRS? I am just wondering because you have a very public website and technically you are supposed to report these gains. I’m not trying to get anyone in trouble I am just curious. Most people who are selling their old stuff aren’t really making a gain on it, but in this case (and several for you) you have. I am more curious than anything. Are you sure you’re supposed to do what with your own personal items? I always thought that if it was a business you had to (since you’re intentionally buying stuff to re-sell them for profit) but if it was your persona stuff you didn’t? Or at least up to a certain amount? I could be way off though… I honestly have no idea. this is an interesting comparison. from what i remember when we were selling furniture on craigslist (before moving), it also took a lot of time to arrange and conduct the transactions, etc. have you found that selling on craiglist is a big time-sucker, in addition to being less leveraged than slashing bills? have you looked at alternative places to sell stuff? I haven’t tried anything outside of Craigslist for this particular mission, but I used to do eBay a bit back in the day. I know some of my stuff could sell for a lot more there, but just too much hassle for me so I stick to the quickest route – even if it means less money. If you have the patience though I definitely recommend using a variety of sites so you can maximize profit. very good point – it’s not all about the money. do you find that most of the new people are from your neighborhood? or from out of town? In fact, just last night I met with someone who rode up in a Mercedes convertible and “only had $20′” to pay for my $10 item – hah. I only had $6 in change so I ended up getting $14 instead :) I sold her a vintage decanter and when I asked if she collected them she said no, her husband is a big whiskey drinker and she was surprising him with this for Valentine’s Day :) I told her she needed to fill it UP with whiskey too and she said it would be too expensive?? Haha… So yeah, the people part is the best. Nice work again J, $3k is an awfully nice number! :) I love the random or fun money – having just finished the holidays and both my wife and I have birthdays we usually get quite a bit of it. We noticed a few years back that we’d just spend it on stupid stuff mainly (well me more so than my wife ;) ). Now, we put it aside and use it to help towards something we want to do together or just save/invest it – either of which is much better than just more stuff. WOW – LOVE that boombox story!!! I’ll have to start checking garage sales more thoroughly now! Thanks, J$, for the Challenge Everything series. It’s motivated us and saved us TONS of cash! I have not gotten any bites for any of my stuff on Craigslist. Any suggestions? I would def. try Facebook or eBay for sure, but hard to say without knowing what items you’re trying to sell and how it’s listed. It’s quite possible there’s info lacking or the prices are too high, in which case it won’t matter where you try selling :) I lower mine a little each week more or less until it’s sold which def. helps. Then again, your area can just be bad for Craigslist so the other areas *would* help more. Wowww $1,800 is no joke! That’s 3x more than what I’ve earned, and I’ve been doing it for 5 months!! You’re killing it! Is that the boom box you mentioned on the podcast? I guess you can’t say you own one anymore unless there are more where that came from. And I love that instead of spoiling your children, you deposited money into your challenge everything savings account. Ours is up to a little over $700 from our auto drafts, which I am psyched about because I am sure that would have been lost money. Hubby and I plan to get better about selling stuff this year and it’s one of his to-dos over his spring break. Would you mind telling what your wife doesn’t like about the phone? I am planning to go Republic Wireless and this would be interesting before I do it. Thank you. Every time I see you’ve sold something on Craiglist I’m amazed. How much stuff do you have? No seriously, you’ve encouraged me to try and sell my crap before donating / throwing it out first. Speaking of your cable bill…I just got invited (and then heard you didn’t need an invite anymore) to Swing TV. Seems like a great way to cut cable and still get the channels you want. Basically $20/month for ESPN, ESPN2, TBS, TNT, HGTV, Food Network, Travel Channel, Disney, and a few others. Add another $5/month for additional sports channels, $5/kids package, $5 for a news package. I’m not sure how to get the local channels, but I’d hope an antenna could get those. I currently have cable built into my rent/HOA fees so I don’t need it, but when I move to a place without cable, this will be very tempting. Solid info though – thanks! My Mom and Dad sent some money for my birthday, and you are so right. Last year, I would have gone out to eat, but I stuck in my saving account right away and will enjoy it for something more meaningful than enchiladas. I should have kept my boom box from high school. It might have been that exact one! i just realized I have to take notes so I don’t forget anything in my comment! 1. *gasp* you’ve never heard of a ghetto blaster? You’ve lived a sheltered life, my friend. 2. I attempted the list 1 item on Fridays and failed miserably. Your post has motivated me to try again. 3. (In my best mom voice), be careful with Craig’s List please!!! Nice! What are you going to use that $3k on? That’s some awesome numbers man! The thing about the craigslist thing is that it isn’t savings like the other stuff. You actually created it! So basically, it’s just a bonus on top. Every dollar saved brings retirement one step closer! I love reading these posts. I especially love the selling of something for as much as (or more than) you paid for it. It’s a good reminder and motivator to get back to it – the selling of stuff, that is. Alas, I am doing what I always do when the worst of the winter weather hits. Burrow until late March. It seems all of my energy goes to my primary money making venture. The rest is for enjoying time with hubby and going to the gym to work off comfort food (secret: I actually had the gym first when I first wrote this – lol). Every year I try to figure out a way to overcome my winter time inertia, but I have fallen into it once again. History tells me that I’ll have a thousand things posted to sell in about 45 days. :) I guess I’ll be happy with that. Good looking numbers. That return for the ghetto blaster is awesome. Great stuff on dropping your cable/internet bill. 3 grand is nothing to sneeze at, you can almost max out the Roth right there. I wonder what your office looks like now that your selling and decluttering stuff? That mirror was hideous, good thing you got rid of it. Joy is a two way street my friend. I smell a replacement for ol’ Ben up top! I mean, who doesn’t want a tsunami of joy? Amirite? you might be on to something there, good sir. That’s some good progress, sir! I’ve been slacking on my own Craigslist plans. Another impressive month! I’m glad that I didn’t renew my cable because I think I was only wasting money on it, so now, I can save for almost $50 every month! Just got off the phone with my insurance agent and knocked $30 a month off my rate thanks to this article. I had all of your notes there in front of me and we were able to cut the mileage driven, raise the deductible, and reduce the medical coverage to save some cash! Getting ready to cut the cable cord this week as well! Holy crap man, way to go! That’s almost $400 this year you’ll save to go towards growing your wealth! Woot. I’m glad I came across your post. Even though I go through periods of cost-cutting, I often need a reminder to get going on selling stuff and making that yearly call to internet provider and auto insurance companies. Enjoying the challenge J. I can’t quite bring myself to bite the bullet on the cellphone and trade in my Iphone 6+. I’ll be honest, I wish I could have my iPhone back but keep Republic Wireless! I hear that Ting Wireless is similar though and you *can* keep iphones with them – so maybe that can be a middle ground? That’s a lot J Money. Saving more than $100 from cell phones is very impressive. I think I am gonna use Republic Wireless so that I can enjoy such benefits. Thanks for giving me idea J.
I love the idea of challenging everything. Leave no stone on unturned. Challenge all assumptions! Uncovering extra and unaccounted for money is a thrill and big motivator to keep economizing. I especially like the use of Craigslist to monetize stuff. As far as that goes: is there anything that you did not consider suitable for Craigslist? At this stage of the game I’m trying EVERYTHING I can on CL first and then if it doesn’t work I’ll go and try elsewhere or just donate it. 10% of the stuff I list I doubt has a standing chance, but it keeps me on track of weekly posting which is the important part – to keep the habit going. And sometimes like yesterday I get surprised and something I had listed 3 months ago sells! But overall yeah – I’m sure some stuff isn’t worth doing like books… I’m 1 for 3 so far with trying to offload those (older vintage ones, not modern ones). Yep, makes sense. See what works and then pivot if it doesn’t. Thanks. Keep up the good work! You should teach a class in Real World Economics :). Yes! I like it. Seriously: write a book. Then get youself an adjunct teaching position at a local college. Or set up on-line courses. The students will learn more of value from you than any economics professor. I have a nib medium green egg cooker to sell. Would CL be a good choice? I have no idea what that is, but yes – Give CL a shot! You can sell anything there :) I’ve also been using the Offerup app too which works here and there if you want to check them out as well. Good luck!